It’s early Sunday morning in November, 7°C with an overcast sky. I’m standing on the outskirts of Berlin in the Düppeler Forest with my eyes closed, leaning against the trunk of an old beech. Trickles of rainwater drip down my cheeks and a moist, earthy scent rises up from the forest floor, which at this time of year is covered in moss and a thick layer of colorful leaves. In the distance a woodpecker is busy tapping away at a tree. “What can you smell, hear, feel, taste?” Lia Braun whispers to us all. I plunge my hands blindly into the soft earth, pull out a piece of bark, rub it with my fingers, sniff it, then actually lick my finger, albeit tentatively – and feel a bit strange. This morning there are 12 of us out here, on the very edge of the city, not far from Wannsee and Pfaueninsel, but so far out that only the bus runs. We’re standing here in the undergrowth all safely wrapped up in several layers of clothing, with a thick pullover, a winter coat and hiking boots, simply perceiving things. 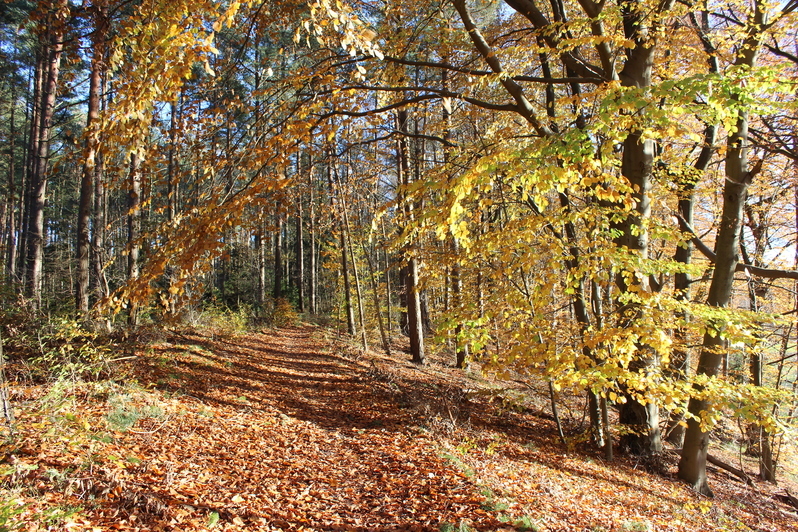 What is a new trend for us in Germany is something long since practiced in Japan: In 1970, the Akasawa Forest was declared the first “Natural Recreational Forest” and since the early 1980s “shinrin yoku” (translated quite literally as “bathing in forest air”) has been part of the government health program. It’s great that attention is growing for the topic. When was the last time I looked so closely? I cannot resist the pull of the forest either. After first exercises in perception, we walk on through the undergrowth; but we do so in absolute slo-mo, in order to be able to concentrate on anything and everything “that moves,” as Lia Braun instructs. And that means not just the crowns of the trees, now only sparsely green and swaying slightly in the wind, but also all the creepy-crawlies on the forest floor, the spiders and beetles, the drops of dew falling from branches onto leaves on the ground, catapulting them upwards. My attention is captured by a small twig that is covered with a pastel-green layer of moss and lichen, and which I can hardly get enough of looking at. When did I last look at things so carefully, touch them, sniff them? After each exercise we re-group and exchange experiences, and what soon emerges is that the initial skeptics among us have swiftly shed their doubts. In our culture the forest has always been a place of fairytales, myths and secrets. The Celts and Teutonic tribes lived in harmony with it, in Norse mythology the ash tree Yggdrasil symbolized the entire cosmos, and the Ancient Greeks spent time in nature by way of medical treatment. The Romantics were fascinated by the unfathomable nature of the deep forest, coined the term “forest solitude” and practiced withdrawing into the solitude of contemplating the forest canopy. Modern urbanites seem to have lost this link to nature in favor of a technological rationalization of our environment. Seldom do we go into the woods, and when we do it is only for a simple walk or as exercise on some fitness trail. We always have to function, to be productive, to earn money – leaving no space for the conscious contemplation of our surroundings. That said, there’s no denying the longing for tranquility and the trend toward more “mindfulness,” be it consciously or unconsciously. If you need books and seminars to rekindle contact with nature and yourself, well, then there’s nothing wrong with that. When, after almost three hours between the birches and beeches, we gather for the last time and drink tea together, which Lia Braun has brewed from the yarrow and pimpernel leaves she gathered along the way, I am freezing and wet but infused with a sense of inner calm and satisfaction that I only too rarely feel in my well-organized, everyday downtown life. Until the 1970s, the Galerie nächst St. Stephan was considered the central venue of the artistic avant-garde in Vienna. It was also here that Bruno Gironcoli celebrated his first successes. The encounter with the films of Nathalie Djurberg and Hans Berg has something of a seduction — they immediately attract the viewer into colorful worlds, accompanied by hypnotic music. For decades, Mark Dion has created a collection of miraculous finds. We were allowed to enter his home cabinet of curiosities and made all sorts of discoveries.